KCI - jacket, 1790 - revolutionary or royalist? These days, many costumers, me included, look to the fashions of the past and select items to make based on, well, their pretty-pretty. I know that I have thought "oh, I want a red gown; oh, I want a black gown; oh, yellow!" without much thought to what these colors represented in various time periods and places. Blue, White, Red - colors of the Revolutionaries. They not only wore these colors as ribbon cockades, but in their entire dress. a liberty bonnet, a man's hat that came to symbolize the Revolution. To be more specific, the red and blue were the original colors of the 1789 cockade, and the traditional colors of Paris. Red stood for Saint Denis, the patron saint of Paris, and blue stood for Saint Martin, a symbol of care for the poor by the rich. The white came in later, and is actually the color of the royal House of Bourbon. The addition of the white to the tricolore cockade was to symbolize Louis XVI's support of the Revolution, which he was forced to show. The three colors are also said to each represent the three estates - the Clergy, Nobility, and Middle Class (or, everyone else who wasn't clergy or nobility, "The Third Estate"). 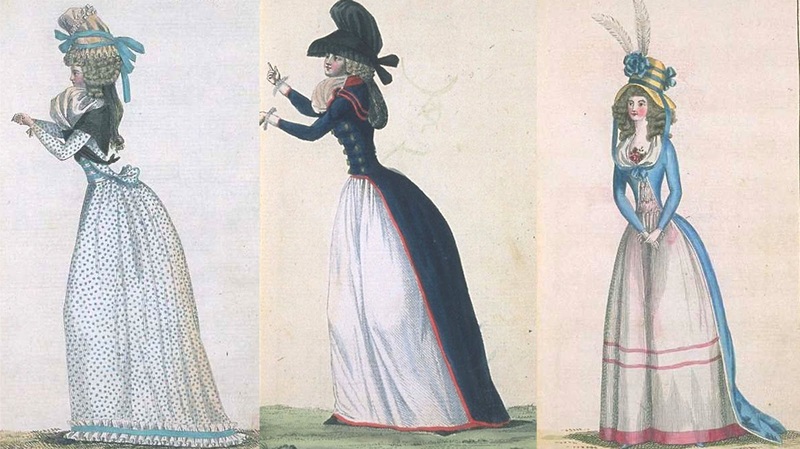 Selections from Dames a la Mode on Tumblr - very Revolutionary costumes. 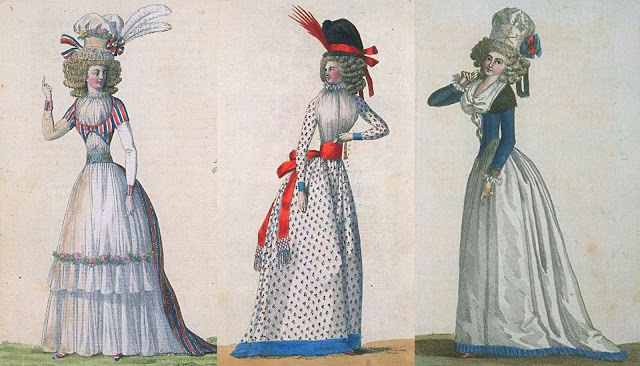 During the early 1790s, in Paris, wearing a costume of blue, white, or red showed your support of the Revolution, and everyone, including aristocrats and Marie Antoinette herself, wore these colors. To the upper crust it was a fad, or it was "safe;" to Marie Antoinette, it was demanded of her, although she would soon change her preferences for more royally-associated colors. Selections from Dames a la Mode - despite the redingote (center) being associated with Marie Antoinette and Austria, in its was commandeered as a nationalist symbol, in its Revolutionary form, as was the gaulle. Black, Purple, Yellow, Green - Royalist colors. These colors, each with their own association, were reviled by the Revolutionaries, and became dangerous to wear. Black and yellow were the colors of Austria, Marie Antoinette's homeland, and much reviled by the people of France. Black was also an aristocratic color in general, and the color of mourning, specifically, at this time, the color of royal mourning, required for everyone in mourning the death of the young Dauphin as well as Marie Antoinette's brother, Emperor Joseph II of Austria. The public completely rejected the latter, and stopped wearing black altogether, in favor of heckling and sometimes assaulting anyone in Paris seen to be wearing a black band, clothing, or cockade. Green was the color associated with another detested French royal, the Comte d'Artois, Louis XVI's brother, who was known to wear his signature color together with another we associate with royalty, purple. After her period of false patriotic show, Marie Antoinette also took to wearing green and purple, as well as the other royal colors. ...and we know that Democrats wear blue ties, and Republicans wear red ties, a sartorial display of allegiance, just like in Revolutionary France. Now, of course, these color "rules" only apply to Revolutionary France, a relatively short period starting in 1789 with the fall of the Bastille. This is not to say that these colors - red, blue, green, purple, black, white - did not have meaning before this date, just that they became even more important during this time. Other countries also had their own color associations and "rules," too, for instance, the buff and blue of the United States, versus the red and white of England. It's always a good idea to brush up on "What Not To Wear, 18th Century," before wearing, say, a red gown to, say, Colonial Williamsburg, 1780. 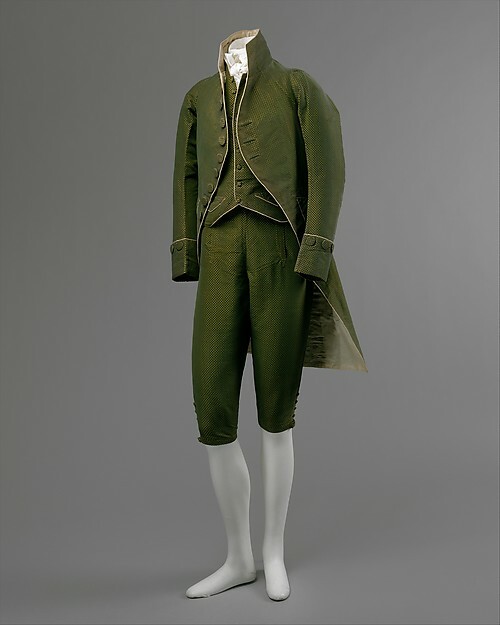 That is a Royalist suit if I ever there was one - French, 1790, The Met. 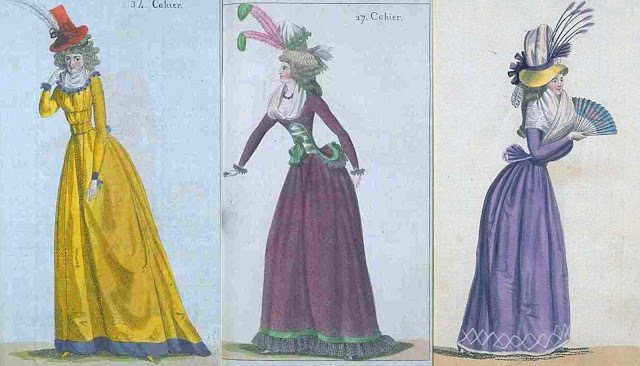 So next time you're perusing the many catalogs of 18th century French dress, musing about your next project, think about how color factored in, what it meant in a political and social context. It is a great way to develop a character to go with your outfit, or at the very least, can spark some interesting conversation. 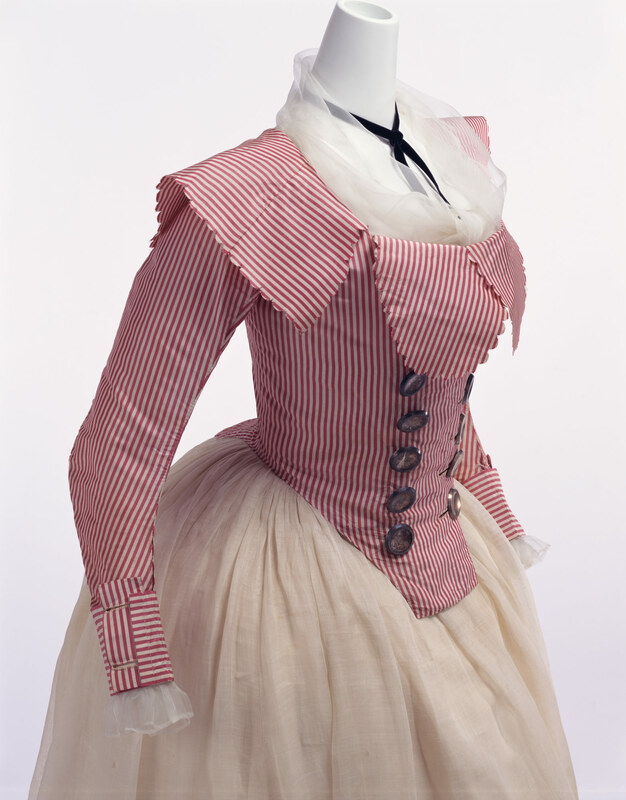 If you want to read more about this subject, I highly recommend Caroline Weber's Queen of Fashion: What Marie Antoinette Wore to the Revolution . 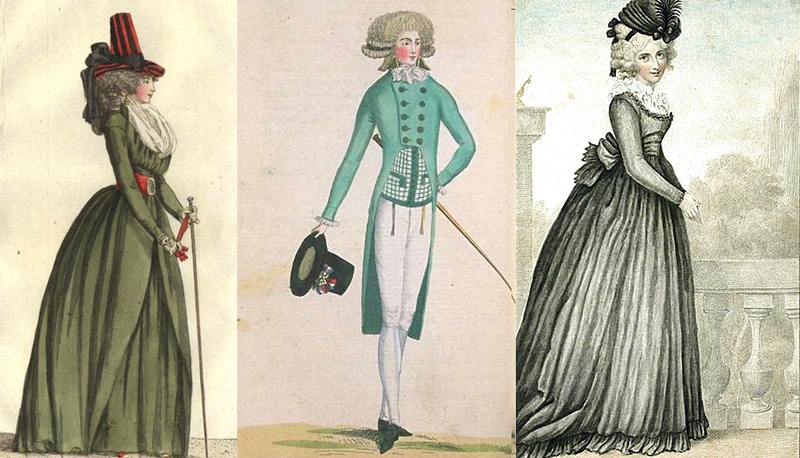 Also visit, just for fun, Dames a la Mode, and have a look through the late 1780s-early 1790s fashion plates, and decide which are Revolutionary fashions, and which are Royalist. Interesting! It's like having to be aware of gang colors, but not...never would have thought about this. Thanks for sharing this information! Absolutely! You could lose your head if you were caught wearing the wrong stuff, secretly harboring a black or white cockade! I always wondered what the different colors were but never bothered looking them up! Thanks so much! I suppose i need to re-read Queen of Fashion, because I'd have associated blue + white with the Bourbons colors, and put the outfit on the right on the first rows into the royalist category... I must look again into the book ! Marion, you are right! That's one of the convoluted things about the Revolutionary code of dress - for instance, Parisian woman wearing a white chemise style dress was perfectly praised, but Marie Antoinette wearing the same was completely hated and criticized. The Revolutionaries seemed to just commandeer certain fashions - the redingote was another - and colors - blue and white, as you say - and hold a double standard for who could and couldn't wear what. Fascinating stuff! Fabulous parade of pictures there. Colour isn't something I've thought much about in that way, thank you for sparking some ideas! I've thought about color in terms of "did this color exist during the time I am sewing for". Hot pink or neon green did not go. I try to think in terms of "would a woman my age, at this time, wear this color or is it too young." I also think in terms of does this color look good on me. Orange is a no go. But, I didn't know it had anything to do with sending messages of association. Was this a common thing in Victorian times (my favorite era)? Was Canada (young country in Victorian times) as affected by these rules or did they wear what they could get because it was better than being naked? I'm sure you can answer for me the first question. Being American, you may not know the Canada question. That's some really neat stuff! I never heard about the colour associations from Revolutionary France outside of the obvious red, white and blue. Kitak, have a read through that book, you'll find it fascinating. Thanks Lauren, another great resource for info about color meanings during the revolution is "Fashion in the French Revolution" by Ribeiro, Aileen. I found it very helpful and interesting! you might want to double check that. I live in a very red part of my state too, but in the electoral college vote my state when blue because of Las Vegas ... there is no mistaking, "red state" = Republican win; "blue state" = Democrat win. I've wondered about colonial color associations. I've never found anything indicating that civilian clothing might reflect the uniform colors of the wearer's political bent--and I've read some claims that red would be seen as associating with rebellion, though no back-up for that, either! I wonder if associating with uniform color is misleading, especially since nearly any color you could think of was used as a uniform color on one side or the other, and sometimes both...but might there be other associations? Rowenna, there is one painting that springs to mind showing colonial color/uniform association in civilian clothing - http://americanduchess.blogspot.com/2010/10/costume-analytics-american-redingote.html - and on the British side, this one - http://lifetakeslemons.files.wordpress.com/2011/04/lady-worsley-harwood.jpg?w=300&h=497 . I don't think it was nearly as obvious as the French, though. And I suppose when the British, French, and American flag colors all end up to be red, white, and blue, that gets even more confusing, lol. It wouldn't be leprechauny, it would be awesome and very dashing! Funny. I'm going to a Regency picnic this weekend, and borrowing a frock from a friend. It's purple and mauve. Mauve wasn't invented as a colour until much later! So I may get a few looks. But I don't care and am going to have a hoot! Certainly good reccomdation though to research colour before making a big period project if worried about authenticity.